Hinkle clearly loves it, too—wild animals and all. This land, now called the Whitewater Equestrian Center, has been in his family for hundreds of years, and now that he has retired from a commercial pilot career overseas, he devotes his time to maintaining a stable of gentle, sure-footed quarter horses and guiding visitors through the woods. 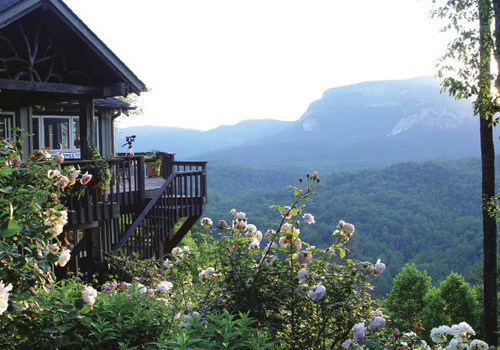 The riches of the Nantahala National Forest surround Hinkle, its boundary snaking along his property. Together, we wound our way to a remote mountaintop, elevation 3,400 feet, through the largest grove of mountain laurel I had ever seen. By June, a cloud of pale pink blossoms would fill the woods; on this spring day, though, before the leaves unfurled, the view from the top reached Lake Jocassee, miles away and thousands of feet below in South Carolina. 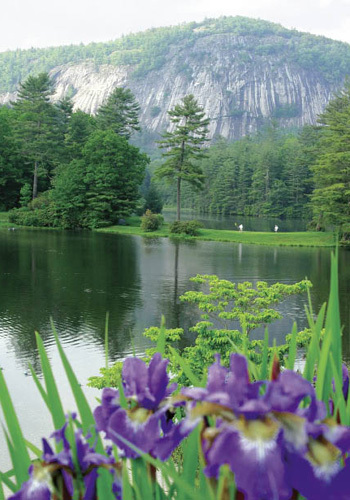 I had come to Cashiers, North Carolina—a straightforward half-day drive from Charleston—for a few days of time travel. Backward, that is, to the early 1970s, when I was a teenager and my grandparents kept a summer home just up the road. Now a recent grandmother myself, I thought it was time to explore that vast wilderness—a kingdom of dark forest and towering silver cliffs, waterfalls and lakes—from a fresh perspective. My nearly two-hour horseback ride was a highlight of this trip, but I was also pleased with the crossroads village of Cashiers and how it provided a perfect base for exploration. My own tastes run to hiking, bird-watching, and barbecue—all within easy reach in town—but there’s also golfing, antiquing, fly-fishing, boating, and fine dining. The emphasis in Cashiers is on relaxation—unplugged and unhurried. The Cashiers Area Chamber of Commerce, with a stock of maps and pamphlets describing local beauty spots, made it easy to drive from waterfall to waterfall. I plotted a course that zigged and zagged to the north and south as well as east and west of town. 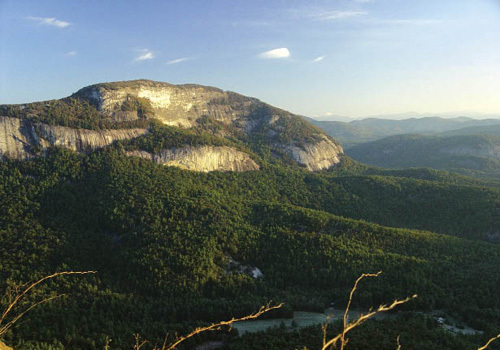 I found the best place to get the lay of the land is Whiteside Mountain, just five miles west of Cashiers. This massive outcropping of granitic gneiss rock rises majestically from the upland forest to an elevation of 4,930 feet and provides not only spectacular views into neighboring states but also an ecosystem capable of supporting endangered peregrine falcons and dozens of colorful wildflower species. 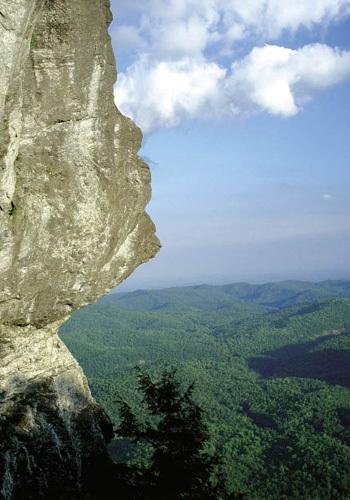 For serious rock climbers, Whiteside offers some of the “biggest, longest, wildest run-out routes in the South,” according to one posted sign. A pleasant walking trail leads about a mile to the summit. The faint of heart can turn around there after enjoying the views or picnicking in the grass, but being a hardier soul, I continued along an alternate route back to the parking lot on a narrow but well-protected footpath just inches from a sheer drop hundreds of feet down. It was almost like flying. More toddler-friendly, to be sure, is Silver Run Falls, less than five miles south of town. 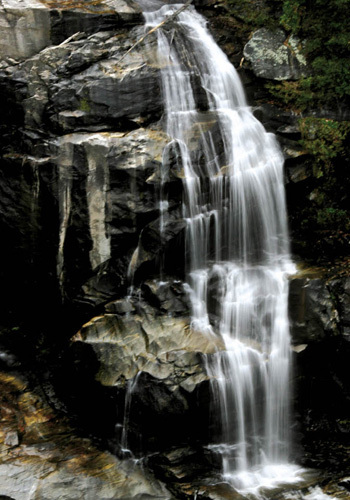 Located close to Highway 107, the falls are a pretty, 40-foot cascade into a shallow pool suitable for wading and swimming. In early summer, the thicket of rhododendrons lining the easy path to the falls blooms like massed orchids. On my travels, one byway stood out: Whiteside Cove Road, which runs parallel to the main highway west, U.S. 64, and below Whiteside Mountain with awesome views of the cliffs above. 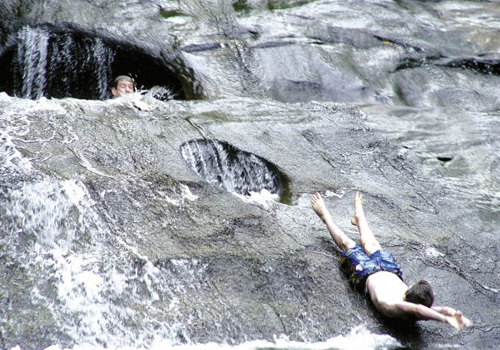 Hiking abounds, but the most popular attraction along this road is a series of swimming holes and a waterfall collectively named Cashiers Sliding Rock or Little Sliding Rock. I also made sure to go back to a waterfall recalled from my teenage past: Whitewater Falls. At 411 feet, it’s the highest east of the Rocky Mountains and more than twice the height of Niagara. This impressive fall appears as a white gash in the forest, and while getting to the viewpoints is easy via Highway 281, there’s no way to get close enough to touch it. 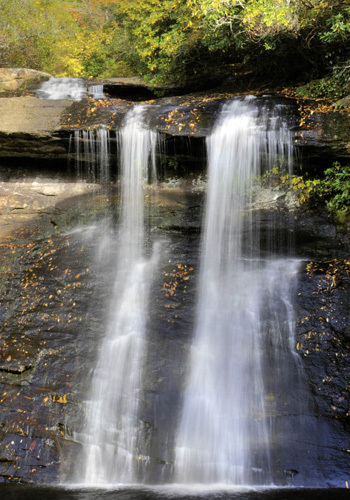 This spring, improved access to the extensive outdoor wonderland will open at one of North Carolina’s newest state parks, Gorges, which will offer hiking, camping, and other amenities on a nearly vertical landscape—there’s a 2,000-foot elevation change over four miles. 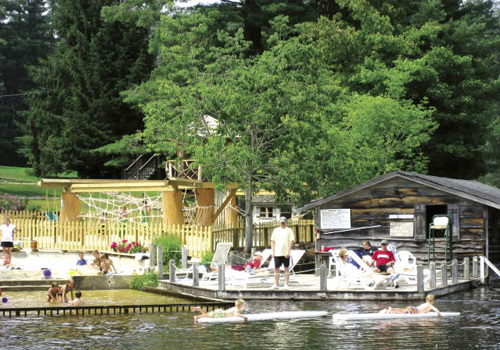 North of Cashiers, the countryside settles into gentler contours, and many families head to placid Lake Glenville for low-key vacations of the pontoon boat variety. 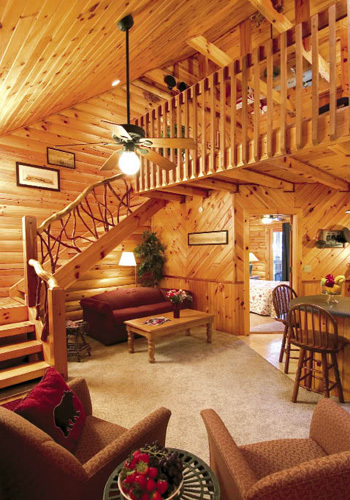 With all this adventuring, I was happy to have booked lodgings at the Laurelwood Mountain Inn, nestled in the woods yet right in the center of Cashiers. I stayed in a comfortable suite with a screened porch and the same piney-clean smell as my grandmother’s long-ago summer home. Out back, the friendly innkeepers told me, a village walking trail links many of the shops and eateries away from automobile traffic. Early morning belonged to me the next day, and after a cup of coffee and take-out ham biscuit from one of the informal diners near the crossroads, I wandered through the new village green, where a raised boardwalk crosses a dense wetland area. What bliss! As the sun cleared the mountain ridge, the morning frost suddenly melted from branches and fell into the marshland like crystal raindrops. The bird-watching was superb—I spotted a pileated woodpecker high atop a dead tree trunk, carefully extracting its own breakfast. As I lingered and listened to the crescendo of birdsong, I found it hard to believe I was standing in the middle of town. That day’s goal before heading home was simple: I wanted to find the entry to Panthertown Valley, an especially rugged and pristine public wilderness area near Cashiers that’s nicknamed the “Yosemite of the East.” Its miles of hiking trails take in waterfalls, cliffs, and exquisite Appalachian wildflowers. And find it I did: winding up, up, up a mountainside until the road petered out to a muddy track. Without a hiking companion or four-wheel drive vehicle, I thought it prudent to stop within sight of civilization. But I’ll be back soon—next time, with friends. 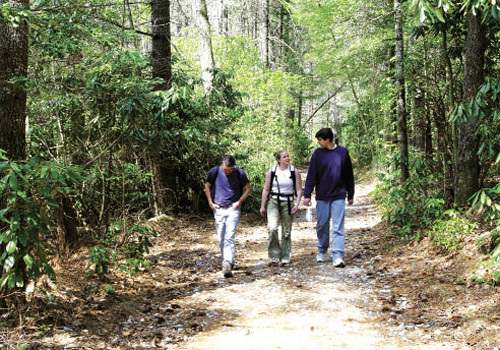 • Join the Nantahala Hiking Club [www.maconcommunity.org/nhc] for regularly scheduled guided hikes, or check out Panthertown Valley [the Friends of Panthertown, www.j-mca.org], Gorges State Park [(828) 966-0900, www.ncparks.gov], and Whiteside Mountain [www.cs.unca.edu/nfsnc]. Be sure to obey all posted peregrine falcon advisories during spring-summer breeding season.